Beginning as early as 1897, members of Congress who wanted to limit immigration to the U.S. began proposing laws that would require immigrants to be literate. 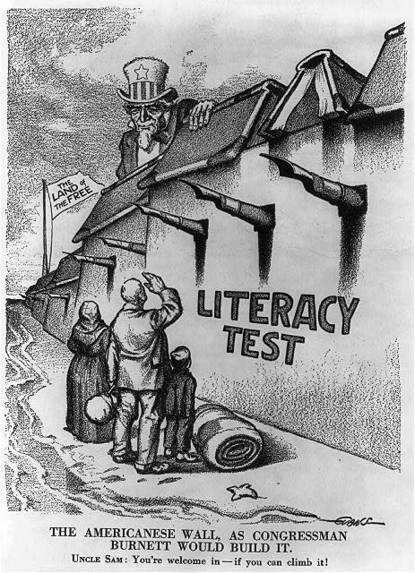 After repeated vetoes of such laws, the 1917 Immigration Act, sponsored by Congressman John Lawson Burnett, finally succeeded in imposing a literacy test on immigrants to the U.S. It required immigrants over the age of 16 to be able to read 30-40 words in any language. Employers often sought and won special treatment for their Mexican labor force, however, securing exemption for Mexicans from the literacy test in 1917 and from the new quota system in 1924. Uncle Sam: "You're welcome in — if you can climb it"
Cite This document | Raymond O. Evans, “"The Americanese Wall, as Congressman Burnett Would Build It",” HERB: Resources for Teachers, accessed April 20, 2019, https://herb.ashp.cuny.edu/items/show/2301.